Home › One Million Climate Jobs › We are facing a global environmental crisis and a global economic crisis. We need solutions to both – now. We are facing a global environmental crisis and a global economic crisis. We need solutions to both – now. 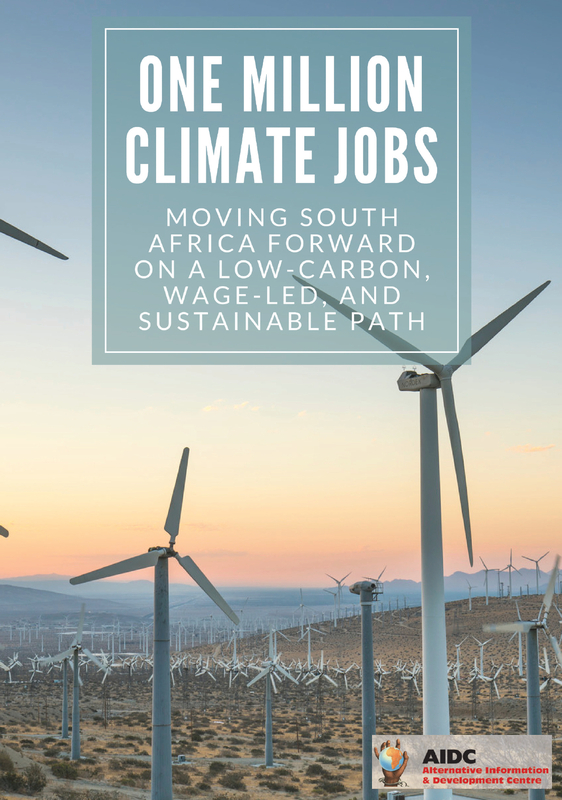 The Million Climate Jobs Campaign is an alliance of labour, social movements and other civil society organisations in South Africa who recognise the value of a joint approach to the problems of unemployment and climate change. It is based on well-researched solutions for how South Africa can immediately progress to a low-carbon economy. Given that climate change will exacerbate inequality and poverty in South Africa by reducing access to adequate food, water, energy and housing, the One Million Climate Jobs Campaign is mobilising thousands of South Africans around real solutions to stop climate change and measures that protect and enhance human quality of life and the natural environment. Over three million new jobs can be created in combating climate change, according to a civil society proposal for a just transition to a new economy. Many millions more can be created if we commit to more ambitious targets to reduce our carbon emissions, improve human wellbeing and protect nature. South Africa has one of the highest levels of unemployment levels in the world. This severe crisis underpins a more generalised social crisis of extreme poverty, hunger, crime, substance abuse, and domestic violence. This in turn affects our health and education system. Women and children pay the heaviest price for all of this. Trade unions, social movements and environmental organisations in South Africa have formed an alliance to campaign for a million climate jobs, now, to jointly address the crises of climate change and unemployment. We believe that it is feasible and affordable for government to directly create or oversee the creation of at least one million climate jobs. Our campaign has two starting points. First, we need work. We paid a heavy price for the global economic crises through job loss and lost state revenue, and there is no end in sight for this crisis – more job losses can be expected. There are already more than seven million unemployed people in South Africa, and more than six million in the informal sector. This excludes many millions of unemployed who have given up looking for work or are involved in various survivalist activities, such as begging. Our second starting point is that we have to stop the advance of climate change and build our defences against its impacts. South Africa is the 12th biggest carbon polluter in the world, and the largest in Africa. To stop catastrophic climate change, we urgently need to reduce our carbon pollution, as do all other big polluters across the world. This, together with building our defences against the impacts of climate change, will require many actions. ▪	Produce our electricity from wind and solar power in a way that is driven by people, meets the energy needs of all, and protects nature. ▪	Park private cars and onto our feet, bicycles, trains, taxis and buses. ▪	Convert our homes and public buildings so that they use less energy and use water more efficiently. ▪	Produce enough food for all people through techniques such as agro-ecology that are labour intensive, low in carbon emissions, protect soil and water, and produce healthy food. ▪	Protect our natural resources, especially water, soil and biodiversity, to make sure that we can continue to meet the basic needs of all people. ▪	Address the legacies of apartheid and build the resilience of our people to withstand the effects of climate change by providing decent basic services (e.g. water, electricity and sanitation) that meet our development challenges in a climate-friendly and labour-intensive way. This will take government regulation and international agreements. It will take a lot of work – meaning many jobs 0 and we have many people who need decent work. A million climate jobs are not nearly enough, but will go some way to reducing poverty and restoring dignity. Moreover, the campaign will stimulate important economic sectors, which, in turn, will stimulate employment growth. This gives effect to the long-standing strategy of trade union movements to stimulate sustainable development and growth through redistribution. We know that South Africa alone cannot stop climate change, but by creating a million climate jobs in our country, we will provide a model for genuine responses. This is more and more important given the repeated failure of the global elites to secure a binding agreement to slow down climate change through cutting carbon pollution. In making these proposals to stop further climate change, we have no illusions that this comes easy. We face the opposition of powerful vested interests who make super profits from the existing mining- and energy-intensive system in South Africa. It is the foundation upon which the capitalist economy in South Africa was built and continues to develop. Our campaign will only succeed through the mass mobilisation of millions of people – workers, unemployed people and activists. We are clear that, in the long-term, climate change requires a massive change in how we live, how we produce and consume, and how we relate to nature and each other. We need systems change. But we need a bridge between where we are now and this vital but longer-term outcome. The million climate jobs campaign offers such a bridge. What do we mean by ‘climate jobs’? ▪	Climate jobs are decent, people- and publicly driven jobs that reduce the causes and impacts of climate change. ▪	Climate jobs are based on three principles: ecological sustainability, social justice and state intervention. 3.	provide and secure vital services, especially water, electricity and sanitation. This includes reducing wasteful over-consumption. Our preliminary research shows that more than three million climate jobs can be created, and we believe that many more jobs will be created if we make ambitious commitments to cut our carbon pollution and enhance our resilience to climate change. Renewable energy reduces both carbon emissions and the environmental and social costs of electricity generation, and creates more jobs than either nuclear or coal power stations. If we commit to producing half our electricity from wind and sun by 2020 and couple this with energy efficiency, we will reduce our emissions by more than a fifth, and create at least 150,000 jobs. 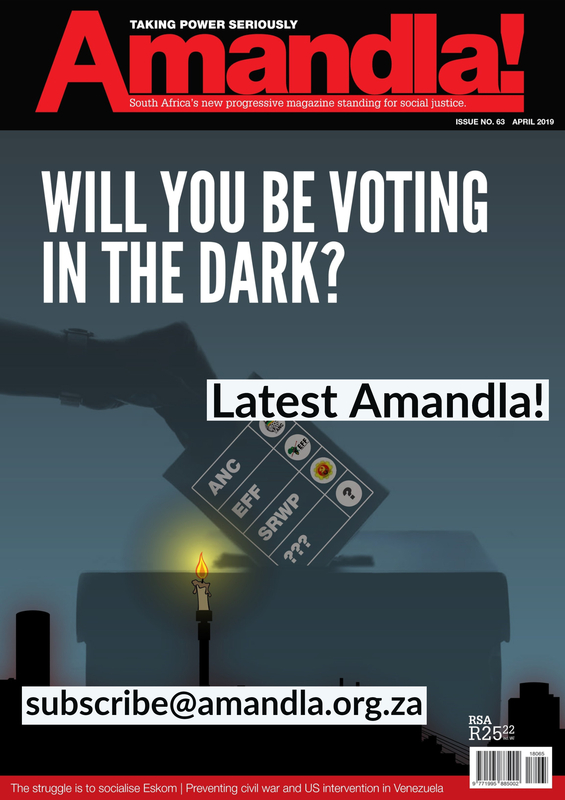 Access to adequate electricity and other cleaner forms of energy is critical for improving human welfare and the quality of life, but almost a quarter of poor South African households experience energy poverty and rely on polluting and often more expensive fuels such as paraffin and coal. If we supplied adequate electricity for heating and cooking, we would ensure not only a reduction in immediate household pollution, but also a higher quality of life. And if we supplied this electricity from renewable energy options such as wind and solar, we would meet an important development need, decrease our overall emissions, and create new jobs. South Africa has excellent potential to produce energy from wind and sun. Compared to coal, renewables have considerably less carbon emissions, few external costs, especially environmental and health, and result in significantly less air and water pollution. Compared to nuclear, it is significantly cheaper and safer, and produces less waste. Renewables can be built in less time than either coal or nuclear create, and use less water than either. It improves energy security by mitigating peak oil and coal. It also enables decentralised energy production, which means that it can be built off-grid and reduce poverty in rural areas. We should also provide other technologies that can give energy services, such as heating in non-electrified households. Solar water heaters would contribute significantly to improving people’s lives, reducing demand for energy, and creating climate jobs. Roll out of solar water heaters must be undertaken in low and high income households. We can produce at least half of our electricity from renewable energy by 2020, and all by 2040. In the next ten years, many of our old coal power stations will have reached the end of their lifespan. By that time, we could supply at least half our electricity needs through harnessing the wind and sun. Renewable energy power plants can be installed faster and more safely than coal (there are already delays with building Medupi and Kusile). If we fast-track renewable energy, we could reduce the need for Kusile, and even shut down some of the heavily polluting old coal power stations. A number of detailed studies show that there is strong potential for job creation in renewable energy. Modeling for 15% renewables by 2020, shows that at least 76 000 new jobs can be created. A target of 50% renewables by 2020 will create at least 150,000 jobs. From 2020 onwards, we should continue to build and develop our renewable energy plants so that by 2040we are producing all our energy requirements from renewable sources. If we implemented energy efficiency alongside renewable energy, we would reduce the demand for electricity and lower the costs. There is huge potential for job creation in energy efficiency. If we implemented a 20% energy efficiency target by 2025, at least 27 000 new jobs could be created. Transport is a significant contributor to carbon emissions, and our current transport system has enormous social and ecological costs. Small but significant shifts in how we transport ourselves and our goods could create at least 460 000 jobs. There is potential for even greater job creation and emissions cuts if we commit to more ambitious targets and actions. Transport currently accounts for more than 10% of South Africa’s greenhouse gas emissions; 85% of this is from road transport, and of this, half is from private cars. Across the entire transport sector, a number of actions can be taken to reduce emissions and improve environmental and human health. 2.	we designed our city and urban spaces so that we would not need energy-intensive forms of transport. ▪	meet operational interventions to reduce shipping emissions. In the transport sector, the most obvious and immediate climate change action is to get people out of their cars and into public transport. If we encouraged only 10% of car commuters (1.5 million people) to use taxis, buses and trains, about 70 000 new jobs would be created in direct transport operations and indirect jobs such as maintenance and manufacturing. ▪	If 200 000 more people caught taxis, there would be an additional 18 000 jobs. ▪	If 500 000 more people rode buses to work and school, there would be an additional 3 500 buses and 42 000 more workers in bus operations, vehicle maintenance and part supply, as well as in bus building. ▪	If 800 000 more people used Metrorail trains, we would need an additional 113 train sets and about 10 000 new jobs. Expand rail general freight: Rail trumps road freight hands down in terms of carbon emissions, costs and capacity to move large and heavy volumes. Reducing emissions from trucking: Emissions can be reduced in the trucking industry simply through using less fuel – by reducing speed, improving driver handling, and improving maintenance regimes. Increasing shipping and developing coastal shipping: We can reduce our freight transport emissions and create jobs by promoting a South African–owned and controlled shipping industry, and developing coastal shipping. Shipping is the lowest emitting form of freight transport and there is also considerable scope for emission reductions through new technology and changing operational practice. Reducing emissions from aviation: Emissions from flying can be reduced through technological changes, and through cutting down short-haul flights. Much of the energy used in flying is spent in take-off and landing. Short-haul flights, therefore, have more emissions per kilometre than longer flights. Industrial agriculture is a significant carbon polluter, mainly because it is energy intensive and wasteful. Climate-friendly food production would reduce our carbon pollution, improve food security and food sovereignty, protect the natural resources that we depend on, and create hundreds of thousands of jobs. Industrial agriculture is responsible for 11% of South Africa’s emissions. Industrial farms, which are dominated by large corporations, are highly mechanised and use high levels of ecologically and socially costly chemicals such as oil-based fertilisers, herbicides and pesticides. Industrialising food production led to a loss of 750 000 agricultural jobs between 2000 and 2010 as a result of mechanisation and casualisation of labour. In addition, this sector’s contribution to climate change is much greater when we include carbon emissions from transporting food – not only from one end of the country to another but also between countries. In contrast, small-scale family farmers and peasants use farming techniques that protect their natural resources, are more labour intensive, more productive per hectare, and driven by meeting social needs rather than profits. In South Africa, we must support communal landowners and the beneficiaries of land reform to realise the potential for localised food supply from small-scale farmers. We must ensure food security and sovereignty in rural and peri-urban communities and shift the pattern of production away from methods that poison the land, deplete nutrients in the soil, and pollute water resources to one that uses organic farming techniques, relies on traditional seed varieties, allows for seed saving and seed security, and diminishes corporate control over the food chain. Agro ecology is recommended as a low-carbon, resource-preserving type of agriculture that is less damaging to the environment and can boost economic activities and employment in rural areas. Agro ecology results in food production that is delinked from fossil energy and avoids greenhouse gas emissions by reducing energy use. Shifting to agro-ecology could halve greenhouse gas emissions from agriculture. Urban agriculture supports food production that is collectivised and socialised. Collectivisation could involve not only production but also consumption of healthy foods in community restaurants and food kitchens, which would also create employment opportunities. Abalimi Bezekhaya (People’s Garden Centre) in Cape Town is a community of organic, urban, micro-farming household and community projects. They documented that if a person converts 250–500 sq m of urban wasteland to organic food gardens, he or she could sell his or her produce at street prices to earn an income of R1 500 per month (after costs). Abalimi also showed that a family of five or six people could provide all its fresh produce needs all year round from a garden of 100 sq m. Overall, the project supports about 3 000 micro-farmers at a cost of R100 per farmer per month. Food sovereignty should be an important basis for food production, and means that different regions should protect their supply and access to food. Doing so would encourage investment in regional food systems, which would promote job creation and economic development.